Okay, so you've started to make new friends. Good for you! But how do you get past the awkward conversations about the one thing you have in common or the weather or recent news items? You have to find fun things to do with friends to have a good time and strengthen your friendships. The reason people get stuck in "acquaintance" status is because they either haven't spent enough time together to form a closer bond or because they haven't made the effort to get to know each other well enough to be closer. Maybe you have friends you've known for a long time-- that's great! Maybe you're making some new friends & feeling a little uncomfortable, not knowing what to say or do with them (that's normal). 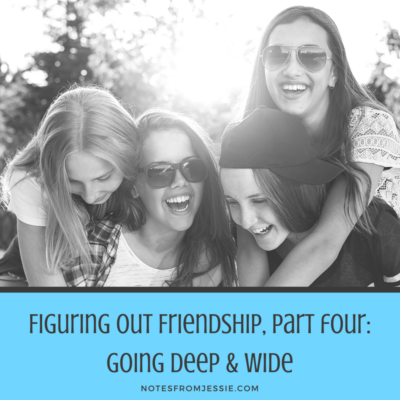 In order to bridge both gaps, I've come up with some ideas (tried and tested in my own experience) to get to know friends, both new and old, better and get past that dreaded "acquaintance" status. Find something fun to do together (time spent together is key to developing strong friendships). Be adventurous and try new things together. Be a local tourist. Experience things together. Not only will you be spending more time together in the process, but you'll get to have time to talk, and you'll have more to talk about! Hobbies, concerts, local events, outdoor sports/activities-- they're all great ideas for things to do together (more ideas will be coming your way later in the series, so stay tuned!). Invite your new friend over (game night, girls’ night, yoga/Zumba night, dinner, coffee, cocktails, DIY pizza, dessert) or out somewhere if you're not quite ready to welcome them into your home. There are so many things you can do together! Be a hometown tourist, traveling to local places new to you (shared experiences are HUGE). Some of my favorite experiences with friends have been day trips to local places like the Sculpture Gardens in Minneapolis, Minnehaha Falls, Stillwater, and Duluth. The trips are easier to schedule because they take less time, less pressure because there's less planning involved, and less expensive because you don't have to pay for a hotel-- it's a win-win-win! Get outside! It doesn't matter what you do, but getting some fresh air and enjoying the sunshine is a great way to spend time with a friend. You can run, walk, rollerblade, bike, canoe/kayak, or do whatever you like to do. And if you don't have any shared hobbies or interests, you can always learn a new skill together, something you're both beginners at, so you can learn together. I took a painting class with friends for another friend's bachelorette party a couple years ago, and it was so much fun to learn how to paint while chatting with girls I hadn't met and reconnecting with friends I hadn't seen for a while. Engaging in conversation beyond the obvious topics can be tricky. Sure, you can ask people about recent news items, weather conditions, favorite this or that, or just stick to chatting about the activity you're doing together (or the shared interest you have). But sometimes you want to go further. That's when it comes in handy to have ideas for what to ask each other! There are so many lists of questions you can ask friends out there on the Internet. I've selected a couple and provided links at the bottom of this post so that you don't have to search for them yourself. Do you have any tips or tricks for getting to know friends, both new and old? I'd love to hear from you in the comments!